The ISA and Tracking board have combined forces to bring you 2 incredible screenplay competitions for 1 low entry fee! FEATURES ONLY! Table Read My Screenplay is offering the Grand Prize Winner a career changing trip to the London Film Festival where they'll workshop your screenplay with a director and have it read by professional actors. The Launch Pad wants to discover new talent, provide opportunities not found anywhere else, and help open the doors that will launch your career! 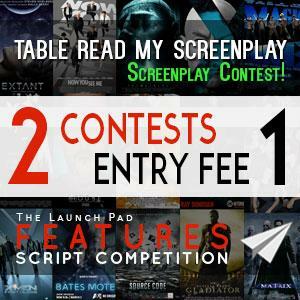 The winning script will be sent out individually to agents, managers, executives, and producers.The script will be sent out to our industry insider list of over 5,500 people.The Tracking Board will do an exclusive interview with our winning writer(s) to be featured on our site. The Grand Prize Winner will be announced on The Launch Pad website and The Tracking Board website.The script will be sent to our esteemed judging panel to be read as well as circulated to industry professionals.Winner's names will be included in the "Honoree" section of the Year End Spec Market book, published by The Tracking Board.Winners will be invited to join our Launch Pad / TB Recommends alumni program.Winners will have mini profiles listed on The Launch Pad website. The Top 10 Finalists will be announced on The Launch Pad website and The Tracking Board website.Their scripts will be sent to our esteemed judging panel to be read as well as circulated to industry professionals.Winner's names will be included in the "Honoree" section of the Year End Spec Market book, published by The Tracking Board.Winners will be invited to join our Launch Pad / TB Recommends alumni program.Winners will have mini profiles listed on The Launch Pad website. The Top 25 Semi-Finalists will be announced on The Launch Pad website and The Tracking Board website.Their scripts will be sent to our esteemed judging panel to be read as well as circulated to industry professionals.Winner's names will be included in the "Honoree" section of the Year End Spec Market book, published by The Tracking Board.Winners will be invited to join our Launch Pad / TB Recommends alumni program.Winners will have mini profiles listed on The Launch Pad website.